The Captain Cook restaurant in Punta Cana is located right on the beach, actually on the Playa El Cortecito if you're looking at a map of the resorts in Punta Cana. Captain Cook's specializes in fresh seafood, prepared as you wait. You're even able to pick your meal out of their barrel of fresh catch and they'll prepare it the way you like it. 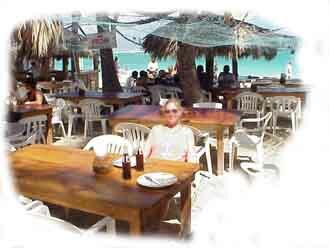 This is a great setting, eating under palapas right on the most beautiful beach in the world - looking at the ocean. This is paradise. While the restaurant itself is not what you'll find at the Jellyfish - some people have even commented that it looks a little seedy at first glance- the food is excellent. If you're at the Captain Cook restaurant in Punta Cana near the end of the day, you'll get to see the local fishermen come in and hang their catch, a really neat photo opportunity. Meanwhile, you'll be put in a romantic mood by mariachis playing in the background. 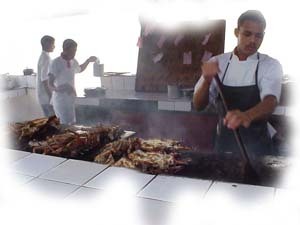 This is a great way to have a delicious meal, see something different and take a break from the resort for a few hours. Our meals have always cost us $20 - $30 including drinks, which isn't very expensive for the amount of fresh seafood you're getting. Warning, you will pay around $45 if you book through your hotel. Your best bet is to call the restaurant directly and make a reservation - they'll even organize to get you there by water-taxi if your resort isn't too far from Captain Cook's restaurant. We don't have a menu up for Captain Cook restaurant in Punta Cana YET, but here are some of our favorite dishes we've tried.